This new set of British postage stamps honors Scotland's favorite son for the third time, beating Winston Churchill (two special editions of stamps) William Shakespeare and Charles Dickens (one each). Thousands of folk with Scottish blood in their veins are planning to attend "Burns dinners" around the world on Jan. 25, to mark poet Rabbie Burns' 250th birthday. US president Barack Obama, who is said to have Scottish ancestry, has been invited to attend a "glitzy" Burns dinner in Washington. People attending those dinners, at which haggis and Scotch whisky are served, will be honoring one of the world's finest poets, who is often called Scotland's favorite son. But he has also been labelled "a racist, sexist drunk?" There's no doubt Burns lived an immoral life, judged by today's standards. But life was vastly different in 18th-century Scotland. Seven of his children were illegitimate, including the first four by Jean Armour before they were married in 1788, although under Scottish law they were considered legitimate after their parents' marriage. Of Jean's children, six died young and another... had no children. All living descendants of Robert Burns and Jean Armour descend from either their granddaughter, Sarah Elizabeth Maitland Tombs Burns (1821-1909), daughter of their fourth son James Glencairn Burns (1794-1865), or their grand-daughter Anne Elizabeth Burns (c1820-1889), illegitimate daughter of their eldest son Robert Burns (1786-1857). The Edinburgh newspaper The Scotsman this week quoted historian Michael Fry as having said, "Burns was a drunk, misogynistic, racist philanderer. Perhaps he was not untypical of Scots, but we have to wonder whether this is the right image for the modern Scotland. By all means, let us celebrate the poetry according to its merits. But, in the same critical spirit, let us deal honestly with the man who wrote that poetry." Britain Express has posted an interesting biography. "Burns spread his affections freely," it says. Special sets of stamps and coins have been issued in Britain to mark the 250th anniversary. 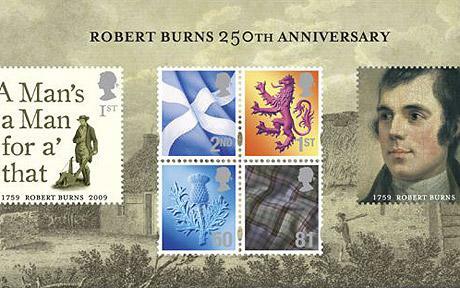 Burns is the first person apart from members of the Royal Family to have been celebrated with three collections of stamps. Britain's wartime Prime Minister Winston Churchill scored two special editions; William Shakespeare and Charles Dickens only one each.